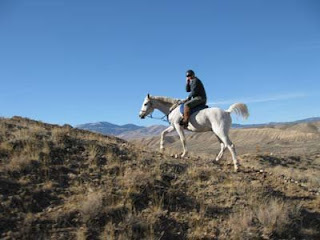 It's in the fine print of the Owyhee Riding Spa riding contract, the one that you don't sign and don't get to see when you come for a visit. "You better be able to hang on, because if you fall off, we won't look back, we won't stop, and your horse probably won't either, so you'll have to walk home. Better bring your compass." Connie's friend Dan came for a visit, and since we like Dan, we took him on the scenic Rim Trail for his first ride. "So, when was the last time you rode a horse, Dan?" I asked, as Connie took off on Finneas trotting down the trail (not looking back). "Oh, about 8 years ago..."
Dan's mount Mac took off after Finneas at a trot. ("Oh! Dan's trotting!") Connie didn't look back, and Finneas didn't slow down. Mac fell into a canter to catch up. ("Oh! Dan's cantering already! I guess he'll be okay!") Connie never looked back. 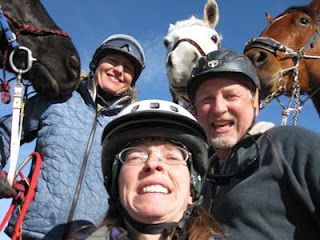 Probably one reason Connie didn't look back (besides she really wanted to ride and she didn't want to turn around and go home, so she was just hoping Dan would stay on) was that Dan got a call on his cell phone (!) and was yakking on it (!!) 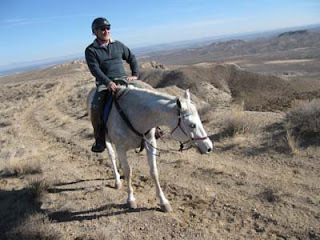 as he rode up the short steep Tevis trail (that scares some people). 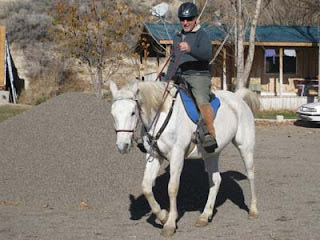 Connie spared Dan no mercy; we headed for the Rim Trail, trotting fast and cantering much of the way, and Dan, who was maybe a cowboy in a former life, undulated right along with Mac and his big trot and rolling canter. Jose and I rode drag, with the job of taking pictures and worrying about Dan. We followed the winding, hilly Dog Trail till we hit Spring Ranch road. 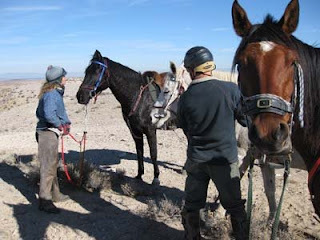 We stopped and waved at one of the ranchers, hauling down a couple of cow horses and cow dogs in his trailer from the mountains; then Connie took off on the trail at a canter. Dan and Mac moved right along, though Dan looked like he was having a wee bit of trouble slowing Mac down at times. There wasn't too much to worry about (we thought), because Mac wouldn't try and pass Finneas (we thought). 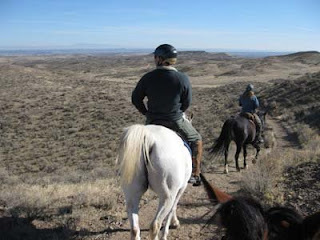 As we took the road that leads uphill onto the Rim, we kept cantering... and that turned into a sustained gallop. Wow, I thought - we are really moving! But Dan's not screaming, and he hasn't fallen off yet... and then our gallop turned into a run, which was really really fun, and amazing... but, I was thinking - what the hell is Connie doing up there! From what I could see when I glanced up from my horse, was Connie and Finneas sprinting up front along the road to the Rim, making no effort to slow down, and Dan following on Mac at a full out gallop, (and Connie never looking back), but I had my own marbles to pay attention to - Jose had almost tried to buck a few times earlier at a canter, and I had never ridden Jose this fast, and I'm pretty sure nobody had ridden Jose this fast. In fact the only time I'd seen any of these horses move so fast is when they come sprinting down to the house from up the canyon every day. I was ready to catch Jose's head if he tried to put his head down to buck, but he seemed to be enjoying this new experience as much as I was. Dan was still sitting his horse just fine, not tipping over to one side or anything, and not showing airspace in the saddle, and instead of screaming he was doing quite a bit of YeeHawing, so I forgot about worrying about Dan, because heck, Jose and I were having SO MUCH FUN!!!! Finally, Finneas started slowing down, and Mac slowed down, and Jose agreed to slow down too. "That was the best ride I've ever had!" said Dan. I was thinking just about the same thing of Jose, and I know Jose was thinking the same thing. We paused to look at the view over the rim, but better than the scenery was rush from the sprint we'd just had. Best of all, Dan didn't fall off and didn't need need his compass to get home. YEE HAW! Sounds like you had a perfect winter's (fall?) day ride!